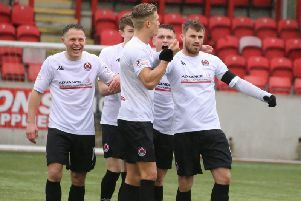 Cumbernauld United held off a late and unlikely Dalry rally to claim all three points at Guy’s Meadow. United totally dominated and keeper Kenny Giles had his quietest game since signing for United yet had to pick the ball out of the net twice. Manager Andy Frame must have aged watching the last 15 minutes, but it could have been so different had Kieran McAleenan had converted the penalty which would have given United a 4-0 lead with only 14 minutes remaining. United came flying out the blocks and went ahead within three minutes. Jamie Kennedy’s to the back post was picked up by Paul McMenamin and he played the ball back to Paul Callander who made no mistake from close in. Callendar also started, and finished, the move that led to United’s second; his slide rule pass to McMenamin had the Dalry defence struggling to get back and McMenamin’s cross was turned back across goal by Kennedy for Callander to tap in. United had several more chances to extend their lead but couldn’t capitalise on them and it remained 2-0 at the break. But they kept up the pressure in the second half and scored a superb third, man of the match Callander yet again involved with a driving run and cross met by McAleenan who rifled a volley into the net. United then missed that penalty, the Dalry keeper not only saving the spot kick but also the rebound strike from Marc Anthony Byrne. And it almost proved their downfall in the last 10 minutes. Firstly the defence went to sleep when Dalry were awarded a free-kick which they took quickly, catching out United to score through Simpson. Then Alan Benton slipped as he tried to gather in the ball, Dalry broke quickly and the ball was played past Giles and into the net by Cashmore. But the end United saw it out for a win which moved them up to third in the table.